Haiku by An'ya. Artwork by myself. "Koinobori" is the carp streamer. It was An'ya who first lured me to the world of haiku and haiga. This was like more than 10 years ago. She, by chance, saw my online artwork gallery, and requested to do some artworks from her haiku. I was then looking for some sources of inspiration to continue producing artworks, and this haiku thing seemed to me a good source. So, I said yes, and started making so called haiga. 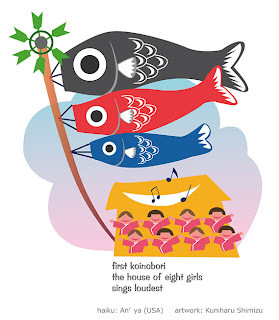 This haiga of carp streamers is one the the first ones I made. The Boy's Day here is May 5th. When my son was born, my father-in-law got him a nice set of the day's decoration, which consists of samurai things like armor, war drum, and such. We already had a set of carp streamers handed down in my family. Now that my son has a boy, all these Boy's Day things belong to the boy. Thus, a family tradition continues.